driveway. HE Washer & Dryer and Outdoor Hot & Cold Shower. and Jacuzzi Tub in the Master Bath. between the 2nd & 3rd bedrooms. Aero Bed if addtional sleeping room is required. Stainless Appliances.....Refridge, Range, Micro, Dishwasher. Not enough seating for family room or for meals. Rest was very nice. Sorry no instructions for any appliance or for other systems. Nothing about whole house vac. Did not tell us building shared. Not as much parking as told. Very noisy with people on other side. They kept moving chairs on roof at all hours and kept waking us up. Room on ground floor did not work with two people as side and head against wall. We couldn't have asked for a more gracious owner and a home full of every amenity we could have asked for. Jim was kind enough to meet us on arrival and show us around the home. The kitchen has every last detail we needed to cook our own meals. Jim also provided boogie boards, paddle boards, beach chairs/toys, towels, and a garage full of bike cruisers for every age. 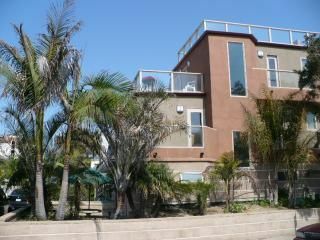 The home is situated exactly 1 block from the beach and 1 block from the bay so you can easily get to both. We had such a wonderful stay and plan on coming back to this home every year. We loved the way this house is situated right between the bay and the beach. We could hear the waves from one direction and seals from the other. It is far enough from the boardwalk to be away from most of the traffic. There was plenty of room for our family, the only drawback was the stairs, if that's a problem for you, but the multilevel made it possible to have some privacy even with a house full of people. Decks everywhere, it was hard to choose where to have coffee in the morning. We hated to leave and hope to come again. ride the Roller Coaster or many other amusement park rides. Diego Zoo are just minutes away. Many Reasturants & Night Life within walking distance.